A leak is a flow of gas (or liquid) through the wall of a vessel (via an imperfection such as a hole, crack or bad seal). Leaks require a pressure difference to generate the flow; they always go from higher pressure to lower pressure. Leaks are pictured as going from positive pressure (inside an object) to outside (at atmospheric pressure). This is not always the case (a leak could be from atmosphere to inside an evacuated object), but it helps to think about it this way because the units and terminology are based on this model. Leak Testing - what units do you use? For leaks of air into atmosphere, units are usually expressed as mm3 or cm3 (cc) per second or minute. So 16.6 mm3/sec = 1 cm3/min. A bubble under water is about 30 - 50 mm3, so 1 bubble per second is about 30 mm3/sec or 2 cm3/min. A standard unit of leakage which takes account of air pressure is the mbarl/sec. (Millibar-litre per second). A leak into atmosphere of 1 mbarl/sec is equivalent to a volume leak of 1000 mm3/sec. Leak Testing - what technique should be used? What size is the component and what is its internal volume? Is there access to inside or is it a sealed unit? What is the leak limit? Is it rigid or flexible? Does it have hidden internal volumes that may affect leak measurements? Are parts at ambient temperature? Are the parts clean and dry? What is the surface finish of any sealing surfaces? 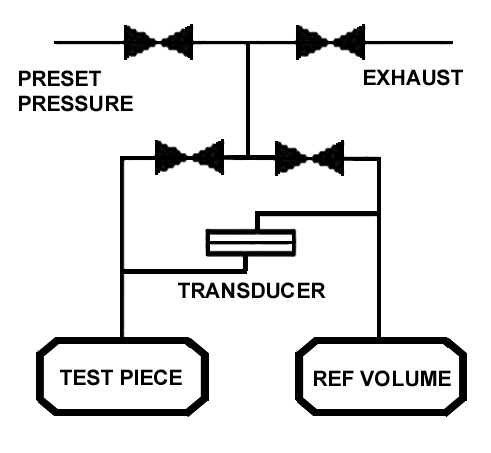 The test piece and the reference volume are simultaneously pressurised (or evacuated) to a preset pressure. The air in the system is then allowed to stabilise, with the supply valves all closed. The Differential Pressure Transducer is automatically zeroed. After this stabilisation time, the pressure change in the test piece is compared to the pressure change in the reference volume, using the Transducer. If the test piece is leaking, the difference will increase and be measured, an alarm limit may be set for a pass/fail decision. The sequence is fully automatic, the accuracy and sensitivity of the system is defined by the method of setting the preset pressure together with the quality and type of control valves and Differential Pressure Transducer. 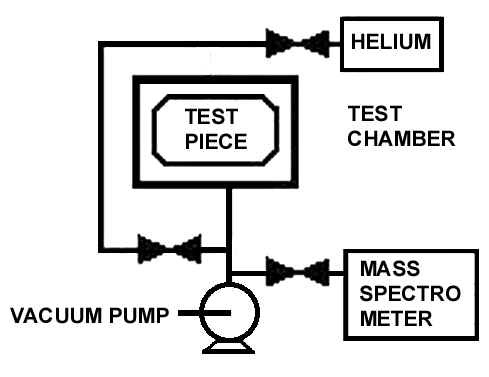 A vacuum pump evacuates the test chamber and test piece simultaneously to a preset vacuum. At this preset level, the chamber and the test piece are isolated and the chamber evacuated further to a very low pressure. A positive pressure variation is therefore created between the test piece and the chamber. Helium gas is then introduced into the test piece, often in a 10% concentration. A Mass Spectrometer analyses a sample from the chamber as the vacuum continues to be drawn. The Mass Spectrometer measures the helium leakage and sets the pass/fail decision.